Dhanya Lakshmi is one of the forms of Goddess Lakshmi. She is the Goddess of food and nourishment and feeds the creation. Dhanya Lakshmi is one of the aspects of Ashtalakshmi, 8 forms of Lakshmi Devi. Dhanya Lakshmi is often depicted as having eight arms and is seen wearing a green dress. 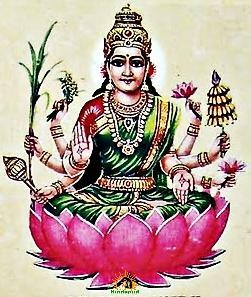 She carries two lotuses, a gada, paddy crop, sugarcane, bananas in her hands and her two arms gesture the abhaya and varada mudra. She is seen seated on a lotus. Dhanya Lakshmi is the Goddess of harvest and blesses with abundance and success in harvest. She is the giver of food grains to everyone in the earth and merges with everyone in the creation. No one on earth can exist without her blessings. It is said that once Lord Krishna at the insistence of his brother Balarama kept Dhanya Lakshmi out of his place as she mingled with everyone, rich or poor, good or bad. But later realised his mistake as he had no food to eat, Then he prayed for her blessings. The one who destroys bad effects of kali yuga and is most desirable god who is personification of vedas. One who arose out of the milk and the form of all that is good and lives in sacred chants and lotus flower and whose feet is worshipped by the devas, Victory to Dhanya lakshmi, the darling of the killer of madhu, Please protect me forever.